Radium Hot Springs, BC, Canada is a hot spring destination located in the Columbia River Valley of British Columbia, Canada. The resort village known as the "Bighorn Capital of BC" is situated near the southern entrance of the Kootenay National Park with the Rocky Mountains to the east and the Purcell Mountains to the west. Excited to be here in Radium Hot Springs, BC! Activities most enjoyed in Radium Hot Springs and the surrounding areas include golfing, hiking, spa, river rafting, fly fishing, camping, wildlife watching, picnciking, boating, canoeing, swimming, beachcombing, backpacking, mountain biking, cycling, ATVing, off roading and zip lining. A few of the more popular activity and sightseeing park and trail destinations located in Radium Hot Springs, British Columbia and the surrounding areas includes the Old Coach Trail, Bugaboo Provincial Park, Dry Gulch Provincial Park, Olive Lake, Kootenay National Park, Swansea Mountain Trail, Dutch Creek Hoodoos, and the Columbia Basin Wetlands. Some of the most visited sightseeing attractions, art galleries, historical sites and cultural venues in and around Radium Hot Springs, British Columbia include the "Home of 1000 Faces", Radium Hot Springs, Windermere Valley Pioneer Museum, Fairmont Indian Baths, and the Kootenae House National Historic Site. Travel services important to travelers in and around the community of Radium Hot Springs, BC includes accommodations (hotel, motel, inns, vacation homes, cottages, resorts, lodges, bed and breakfast, rental suites, hostels), tours, guides, campgrounds, pubs, restaurants, gas stations, gift stores, liquor stores, grocery stores, coffee shops, cell service, internet, banks and taxi transportation services. 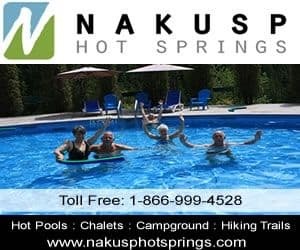 Explore Radium Hot Springs, British Columbia, Canada Travel Guide for Accommodations, Attractions and Adventure. eh! Plan to Visit Radium Hot Springs today.